There is a story in the Old Testament that has always fascinated me. In Genesis 9, we see where Noah had gotten drunk. Not only that, but when he fell asleep (or passed out in his drunken stupor), he was naked and uncovered. Ham saw his father’s nakedness and decided to expose it by telling his brothers. Shem and Japheth took a garment and walked backwards into their father’s tent, spreading the garment across the naked and drunken Noah. They didn’t see their father’s nakedness, nor did they gossip about it to anyone. When we’ve been mistreated, we often desire to share all the gory details with anyone who will lend us an ear. What we fail to realize it that every time we retell the event, it allows the incident to become larger and larger in our mind. We shouldn’t be surprised when we find it very hard to grant some grace and forgiveness to the offending party. If we would have chosen to ‘cover up’ the offense, it would have died down very quickly in our mind. When we have been offended, we are told in Matthew 18:15 that we need to go to that person and show him his fault ‘just between the two of you.’ When we do this, we are ‘covering up’ the offense in a loving way. Most often, the result will be a peaceful resolution and it will bring glory to God to see His children walking in truth. Do you need to ‘cover up’? AMP: She girds herself with strength (spiritual, mental and physical fitness for her God-given task), and makes her arms strong and firm. CEV: And she always works hard. MSG: First thing in the morning, she dresses for work, rolls up her sleeves, eager to get started. Notice that in the Amplified version, the first kind of fitness listed is spiritual. That should be our number one priority. I cannot stress enough the blessing of rising early to meet with the Lord. I started this habit over a year ago, and I treasure it immensely. As I have been faithful in doing this, I actually heard the Lord call me by name one morning. I’ve heard Him say ‘Daughter,’ or ‘Child,’ but this time, He spoke my name! It thrilled my heart when the Lover of my soul woke me up, calling me by name! Mental fitness is listed second, giving it a great deal of importance. It helps me to mentally think about the week before me, so that I’m not so prone to being caught off guard by something. Every evening I think upon the next day, and begin to get things set out at night. It makes it so much easier the next day when I need those items. I don’t even want to address the area of physical fitness because I lack so terribly bad in this area, but the Amplified version does mention it, so it must be rather important. My favorite exercise, if you can call it that, is simply cleaning the house. I HATE to exercise, yet during the summer months when Rachel and I would go bike riding, it would always rejuvenate me. One particular time it was a bit too much invigoration for me because we were being chased by a vicious dog! Being that I was once attacked by a pit bull, I don’t care for that kind of invigoration! I have read many times how important it is to a woman’s frame of mind to exercise. It helps to curb depression, it’s good for you mentally, it will help with PMS, and a myriad of other benefits. It may also be another way of ‘doing your husband good.’ He may like the results he sees if you take the time to get physically fit. This verse mentions working hard and being eager to work. I often find that if I put on some praise music, I will be much more energetic while I am cleaning. Another thing which motivates me is to remember the verse that admonishes me to do everything as unto the Lord. I know that when I clean my house and do all of my tasks joyfully, it’s the same as if I did them for my Lord. ** I wrote this nine years ago. Until 2009, when I entered the workforce, I was quite the couch potato. That mentality stayed with me when I would come home in the evenings, especially once I started working in the ER, where I could easily walk four miles in one shift. Now if I don’t get my usual workout time, I start to feel really icky. Working out helps me physically and emotionally. If I come home feeling really stressed, I will do a cardio workout. It does wonders!!! Once finished, I am rejuvenated and in a much better mood, which helps me to focus on the tasks that need to be done. Plus, it helps me not to fall into that ugly trap of being a nag, and hubby loves that! One final thing I want to mention in the benefits of getting fit is that doing so revived our s*x life. When I was overweight and had no muscle mass, I had zero interest. Now hubby and I are like newlyweds. Just ask my daughter — she gets totally grossed out by our constant flirting and touching. A lady taught me that in American Sign Language, the sign for “comfort” is the same sign used for the word “convenient.” We often hear people talk about stepping out of their comfort zone, but I want to take a look at stepping out of our “convenient” zone. When Jesus went to heal a paralytic, He faced persecution from the religious leaders. (Matthew 9:1-8) Having faced much persecution from people, even in the body of Christ, I can attest that there is never a convenient time to deal with these kinds of issues. How many times have you tried to withdraw to a solitary place, only to have someone call for you? Jesus knows how that is. (Matthew 14:13-14) In spite of the need to pull away, Jesus set aside convenience once again, in order to bring healing to the people. We will have many opportunities to minister to others. Often, it will not be at the most convenient time. Yet, if we choose to be compassionate like Jesus, we may find that God uses us to bring healing to them. We just need to get out of our “convenient” zone. MSG: She looks over a field and buys it, then with the money she’s put aside, plants a garden. AMP: She considers a new field before she buys or accepts it (expanding prudently and not courting neglect of her present duties by assuming other duties). With her savings of time and strength, she plants fruitful vines in her vineyard. CEV: She knows how to buy land and how to plant a vineyard. I love what the Amplified says because I have seen women who neglect their duties at home, to ‘do the Lord’s work.’ They haven’t learned that for a mother (especially of young children), ‘the Lord’s work’ is for her to be busy at home, taking care of them and the house. Let me address those who may be forced to work outside the home. I realize that some ladies are submitting to their husband by working outside the home. In that case, part of doing ‘the Lord’s work’ would be your occupation, because by doing it, you are submitting to your husband. I would like to encourage those of you who are working outside the home to pray diligently for God to make a way for you to be able to stay at home. Many times we want to pray for God to change our husband’s heart if we don’t like, or don’t agree, with his way of doing things. Before you start praying so hard for God to change your husband’s heart about having you work outside the home, pray for God to help you to be joyful in your occupation while you wait for Him to open the door for you to be home. You need to realize that God may be testing you to see if you can learn to be content in whatever circumstances you are facing. He may be testing you to see if you will willingly and joyfully submit to your husband’s wishes for you to work outside the home. He may be testing you to see if you are going to harbor resentment against your husband while you are working. Sometimes we want something so badly that we fail to learn the lessons that Father desires to teach us while we await His answer. We are too busy praying to be delivered, or praying for God to change our husband, when it may be that God is desiring to change US! At one point, I was prayerfully considering a business venture to try and make some money while I continued to be a stay-at-home mom. Before I bought this ‘field,’ I had to pray about it, talk to my husband about it, and wait for God to give me a release in my spirit before I went ahead with any plans. I knew that buying this ‘field’ would require some money up front, with no guarantee that I would even break even, let alone come out ahead financially. As I discussed it with my husband, he felt that it wouldn’t be worth the risk, so I knew that through his words, God HAD spoken, and He spoke through my husband. I felt a complete peace about it once my husband said ‘no’ to this particular ‘field.’ In a matter of only a few months, I found an even better way to supplement our income, yet still be able to keep on top of things at home, and homeschool Rachel. This new ‘field’ is even one where Rachel is able to help me, and she even sees where some of the money goes. The Message Bible mentions the money she has put aside. Every time I have a garage sale, the money I make is put back to use for my spending money to buy gifts for my husband, or to use in purchasing clothing for Rachel. Some of the money also gets put aside into my homeschool fund. When have a garage sale, I will often make cookies to sell. All of the money goes into my homeschool fund. When I felt the leading of the Lord to homeschool, I was shocked when I saw the costs involved in paying for books. I told the Lord that if this was what He wanted me to do, He would have to provide the funds for it. Setting aside an envelope, marked for homeschool money has been a great way to fund this venture. Every time I sell something related to homeschooling, I put the money in that envelope, to be used later on purchasing new school books. When I take my mother out to run errands, she always gives me gas money. That money is also put aside for my homeschool fund. As I have a few extra dollars at the end of the week, I will add to the fund. It adds up quickly, and it has been amazing to see how with my own creativity in saving, I have been able to pay for all of the school supplies without asking my husband for any money. Another thought on this portion of scripture is that the field to which it refers could represent the field of our children’s heart. We need to tend and nurture that field so that our planting there will reap a good and plentiful harvest in years to come. Just as a vineyard requires many years of tender care before it yields forth its fruit, so our children require many years of tender care. We can see in this verse that she invested in different things. We often need to check our investments. Where are we investing our time, talents, energy, thoughts and affections? Do we need to change our inventory? ** If you look at the copyright date above, you can see that this was written nine years ago. Since that time, my husband’s business was greatly affected by the economic crunch, forcing me to find work outside of the home. So for the time being, I am investing my time and talents in a different “field.” I have been very blessed by the Lord to find favor in my new field. At the time I applied for the job, over 200 applications had been turned in, and she was only going to hire two people. I also keep that frugal mentality in the area of clothing. I rarely pay full price for any clothing items. We are blessed to have some fantastic resale shops in our area where I can buy like-new items for a fraction of the cost. Another way to “consider my field” is to be mindful of errands that need to be done. I try my best to get all errands done in one day, and in a manner where I’m not wasting a lot of gasoline to do it. I pass most of the places where I need to run errands on my way home from work, so it makes sense to get them done before coming home so that once I’m home, I can stay home. Even with working outside the home, we have still managed to homeschool. It hasn’t been easy, but it’s been worth it. We are currently in our final year of homeschooling. So this “season” will come to pass in just a few months. As you can see, sometimes our “field” will change over time. Yet God is faithful to lead us and strengthen us to work whatever field He gives us. Do you need to de-clutter? CEV: She gets up before daylight to prepare food for her family and for her servants (or to tell her servants what to do). AMP: She rises while it’s yet night and gets (spiritual) food for her household and assigns her maids their task. MSG: She gets up before dawn, preparing breakfast for her family and organizing her day. I like what the Amplified verse says because it speaks of getting spiritual food for her household. Before she gives out spiritual food, she has to have some within in her, leaving me with the impression that she lived her life by Job. 23:12, esteeming the words from His mouth as more important than even her food. She arose early, knowing that her day would be very busy, and she spent time with her Lord. Because she gave Him the firstfruits of her day, He developed a very strong, moral character within her. She showed by example that she had a willing heart, ready to be changed and molded by the Lord. 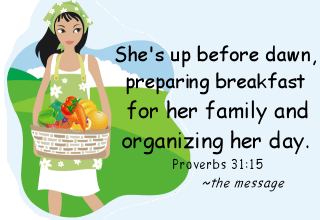 The Message Bible mentions that she organizes her day. It is so important to have a plan. If we don’t, we tend to go haphazardly through our day, and at the end of it, we feel like we were spinning our wheels, and going absolutely nowhere. For me, my best time for organizing is the night before. I get out the nonperishable items for the next evening’s meal. I check the menu to see how much ‘prep’ time I need to allow. If I will be using the crock pot, I set it out the night before. If there is laundry to start in the morning, I will often separate it into piles. I always have my clothes laid out for the next day. Doing these little things keeps me from getting so distracted in the morning when I spend time with the Father. In the CEV, it mentions her servants. I have many servants, and I am SO thankful for their help. Their names are washer, dryer, microwave, automobile, and refrigerator. You may not think of your refrigerator as being a servant, but back in the days when the Proverbs 31 lady lived, they often had to go to the market everyday. If they didn’t go to the market, then they would at least have to be working in the garden or milking the cows or goats so they would have food and drink. Because of having a deep freezer and my refrigerator, I don’t have to be running to the market nearly every day. My ‘servants’ drastically lighten my load so that I can do other things. In fixing breakfast, I have made it a habit to take time to sit down and read a devotional to Rachel that is geared for her age. Then, we sit there and discuss it. While she it getting her physical nourishment, she is also receiving her spiritual food. We also find in Proverbs 31 that the virtuous woman not only cleaned her physical house, managing it well, but she also invested time into taking care of her spiritual temple, nurturing it. Just as Mary called herself a handmaiden of the Lord, doing her very best to nurture and care for the Christ child, whom she held in her arms, we must nurture and care for the Christ who lives within us. I have read many articles on how infants will wither and die without physical touch and nurturing. This is true in a spiritual sense — failing to nurture the life of Christ within us will cause that life to wither and die. Have you done any nurturing lately? Blessed Are You Among Women?